Note: The JCK Show this year again runs Friday through Tuesday. The AGTA Pavilion still opens one day early—Thursday, June 2—before the main JCK Show. The first Santa Barbara Jade and Ocean Arts Festival will take place in mid-May at Chase Palm Park on the Pacific Ocean. Ocean-themed artwork from a variety disciplines will be offered at the festival. And, of course, jade. This month we feature something a little out of the ordinary—a local Californian/Mexican treat. Pala has found a new supplier of these ocean jewels and it has been exciting to see all the freeform shapes and iridescent colors nature can conjure up. Greens, blues, pinks, purples—oh my! These colorful metallic looking concretions spark in the viewer a wonder of formation and inspire design, as many shapes are personified or reminiscent of earthly objects. For instance, the featured piece below takes on the form of a hot air balloon or a tropical sea creature. Abalone shells were once completely legal to pry from the ocean floor. For divers, all it took was some scuba gear, some hardware, and a shark radar. Today most of these abalone species are becoming endangered and many restrictions apply on fishing. Fortunately most of the abalone taken from the sea are harvested legally, but an estimated 12% are poached illegally. 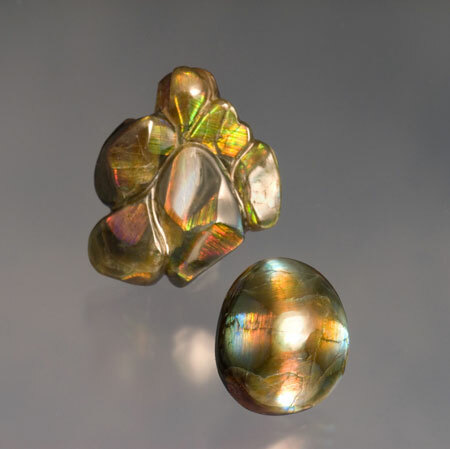 Natural abalone are estimated to produce a pearl only in one out of 50,000 cases, and it can take as long as eight to ten years to form a pearl. Farm raised abalone can produce a pearl in a shorter, two-to-three-year period. See this government website for current information on abalone. 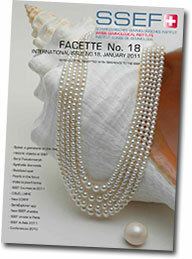 For more on natural pearls see this article by Elise Skalwold from our January edition. 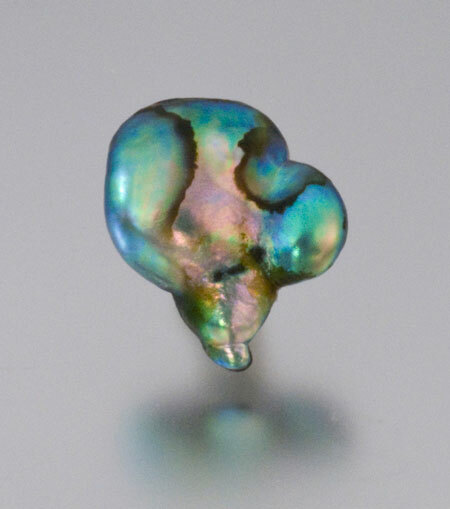 GIA (Gemological Institute of America) Laboratory, Bangkok: “An Imitation ‘Melo Pearl’” takes the reader through the steps of identifying a 52.49-carat “pearl.” Employed in the process are visual examination, obtaining specific gravity, microradiography, ultraviolet lighting, and three spectrometry tools. Large images provide useful illustration. If you subscribe to GIA’s G&G eBrief, you’ll want to see “Non-nacreous Pearl Imitation” in the March edition. 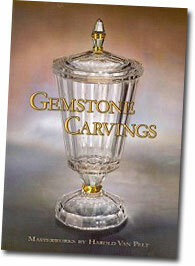 The same issue of G&G includes “A Study of the Gems in a Ciborium from Einsiedeln Abbey,” in northeastern Switzerland. 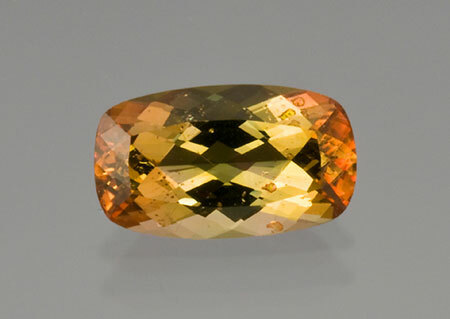 Various nondestructive techniques were used to examine its 17 colored stones—ten almandine garnets, four grossular garnets, and three sapphires. 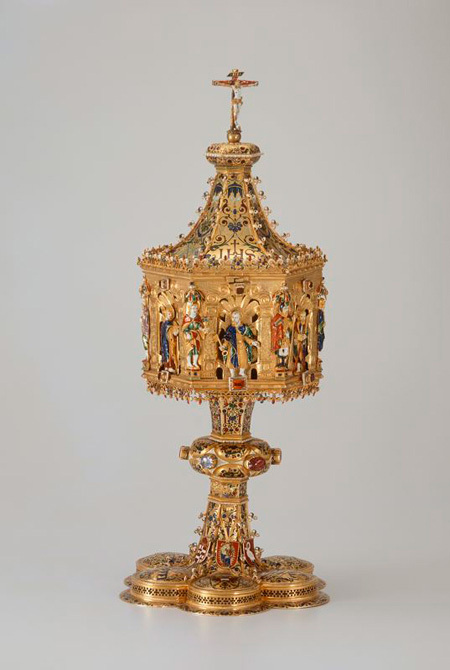 The ciborium’s historic description and the sapphires’ inclusions suggest the stones’ origin to be Sri Lanka. 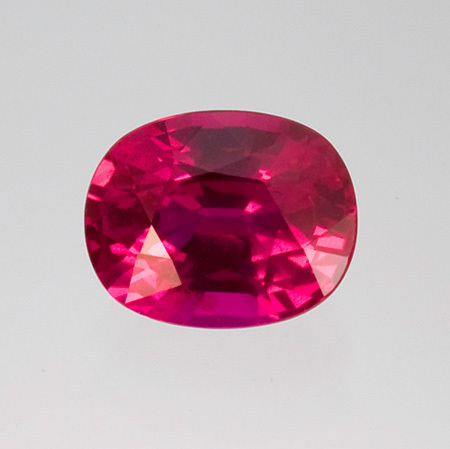 Lucerne’s Gübelin Gem Lab (which has a nicely revamped website) participated in the above study, and also contributed the featured item to G&G’s regular Gem News International section, a study of one of the lesser known in a baker’s dozen of tourmaline group members. 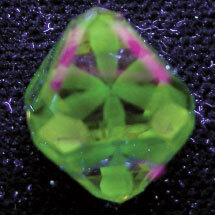 “‘Neon’ Blue-to-Green Cu- and Mn-Bearing Liddicoatite Tourmaline” is the first study of such stones, which are strikingly “similar in hue, tone, and saturation to Paraíba-type tourmaline.” They may have come from Mozambique, near the mine that produced last June’s featured stones from Pala International. That could be welcome news, because the latter gem material is virtually played out. 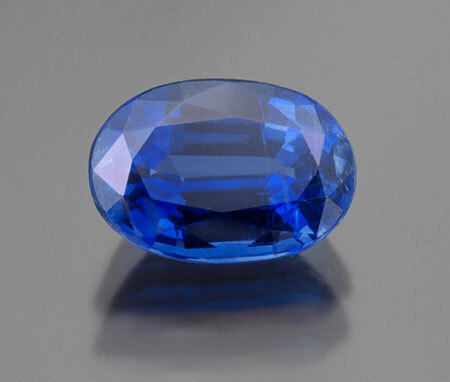 And more from the Swiss… Basel’s SSEF Swiss Gemmological Institute (also with a redesigned website) has posted Dr. Krzemnicki’s “Fancy Coloured Sapphires: The Beauty beyond ‘Blue’ of Sapphire and ‘Red’ of Ruby,” which provides a very visual overview of the subject. The man for whom the mysteries behind phenomenal gems are a passion, Dr. Karl Schmetzer (author of Russian Alexandrites, a review of which we missed earlier, by Richard W. Wise) and his coauthor Dr. Eric Erel (of Carat Gem Lab) take a look at a more obscure, though no less fascinating color-change gemstone in the current Australian Gemmologist: Brazilian triphylite. The samples examined also displayed distinctive pleochroism. Political unrest in southwest Asia is inflating the price of fine gemstones, according to a March 12 story by Agence France-Presse (AFP). Conversion of wealth into portable property is the strategy. Hong Kong show exceeds expectations with very strong buying activity. Show indicated a shift to seller’s market as shortages and increasing Indian and Far East demand enabled higher prices. Investment demand building as Mid-East political instability increases demand for large fine quality D-IF and other high quality investment diamonds. De Beers reports unprecedented rough demand at Feb. Diamdel online auctions. DTC launches sightholder application process for 2012–2015 contract period. Last month, we pointed to the creativity of NZ gem and jewelry appraisers who were donating a day’s fees to the Red Cross, and holding “Valuation Saturdays”—à la Antiques Road Show—with all appraisal proceeds from the events benefiting the cause. 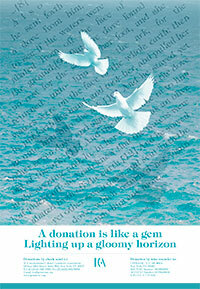 Recently, ICA issued a separate call for donations. ICA has decided to open a donation channel and let all of us who would like to help – donate a sum of money that will be collected by ICA Head Office and donated on behalf of ICA by the ICA Board of Directors. The decision on which charities and countries will receive the donations will be taken during ICA General Assembly at the ICA Congress in Rio de Janeiro. The downloadable poster shown above has details on exactly how checks and wire transfers can be facilitated. The 48th Myanma Gems Emporium, held March 10–22, exceeded €2 billion ($2.8 billion), according to an early April story in the online weekly The Myanmar Times. The sale essentially matches the grand total of last year’s three sales ($2.821 billion). 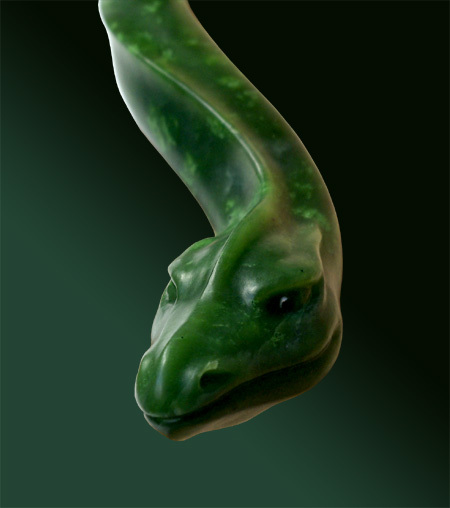 Out of nearly 17,000 jade lots on offer, 13,608 were sold. About half of the 8,700 buyers in attendance were foreigners. Only 30 out of 206 gem lots were sold. A Myanmar Pearl Enterprises rep expressed satisfaction after 253 of 285 pearl lots also sold—23 more than at the last sale, in November. The above image comes from The Best Friend, members of which felt the March 24 earthquake in their location in Chiang Mai, Thailand. 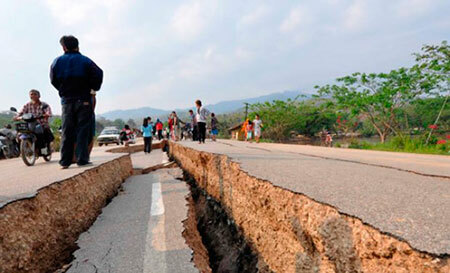 They have begun a Shan State Earthquake Relief Project. In January, Bill Larson was contacted by Ehrmann’s son Herb Ehrmann, and after a hook-up in Tucson, Herb and his wife Connie visited Pala’s office in Fallbrook, bearing a gift: the elder Ehrmann’s unpublished manuscript, “The Ruby Mines of Mogok,” complete with a box of color slides. The Bowers Museum is exhibiting a body of Harold Van Pelt’s work, which showcases his great skill of gem and mineral carvings. It will run until May 1, 2011. Harold and his wife Erica are known throughout the world for their photography of fine gemstones and mineral specimens. Pala International’s own in-house photographer, Mia Dixon, looks at the exhibition catalog. We still do not know, but there are a few factors we can state with some degree of confidence. First, artistic sense—what might be called an artist’s eye. As highly accomplished professional photographers, Harold and Erica have it in spades. That means a keenly developed sense of form, structure, design, color, and all those things you’re supposed to know in the arts. Peter Keller, the President of Bowers Museum, then proceeds by interviewing Harold Van Pelt, discussing how Harold got started in mineral carving. 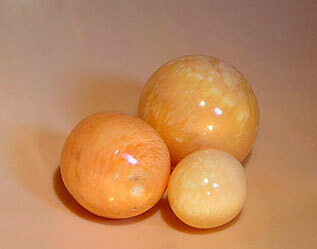 It all started in the late 1960s when the Van Pelts purchased agate nodules and quartz crystals at the Tucson show. Harold began to remove material from the center until only the rind on the outside was left. They chose agate because it was easily obtainable, and when they traveled to Brazil for a photography job at the mines they obtained more. 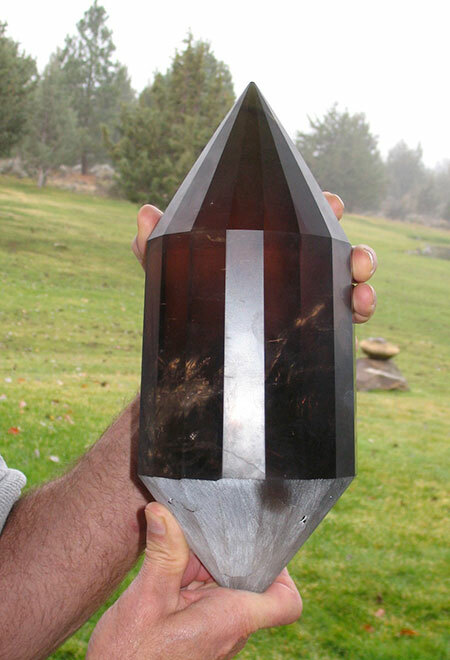 The quartz crystals came from Arkansas and California. Harold built his own equipment by converting a metal lathe (vintage 1925) because at the time the tools and machines he needed weren’t readily available for purchase. 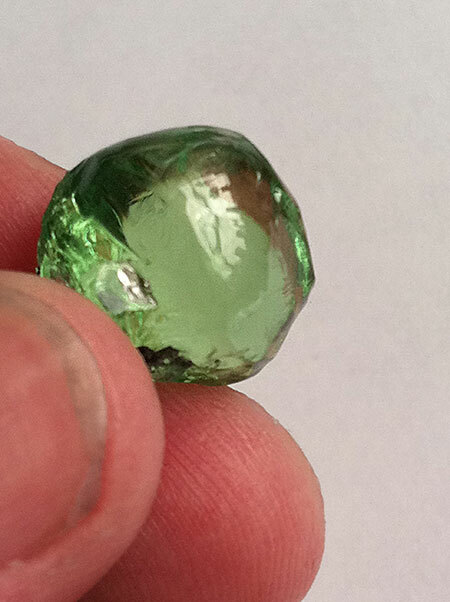 hit a spectacular pocket of tourmalines with the blue cap. It was a major, world-famous discovery. We photographed most of the specimens here in our studio using 8x10 and 4x5 Ektachrome film. That was our beginning. One of Harold’s most famous pieces is a rock crystal ostrich egg that measures 5" x 3", featuring walls that are only 3 millimeters thick! 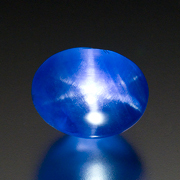 The procedure in making this faceted egg is described in words and photographs. Harold has carved more that 80 pieces, and he has not sold a single one of them. Gemstone Carvings: Masterworks by Harold Van Pelt includes many wonderful photographs of his carvings, but my favorite must be the one of an 8" high freeform quartz container with a natural (!!) inclusion that looks exactly like a hummingbird. It even shows feathering on its belly, and I am just amazed by what nature can come up with. With this edition of our newsletter we extend our hearts, prayers and resources to the people of New Zealand and Japan. Please consider these appeals. Kashmir Sapphire Production to Resume? 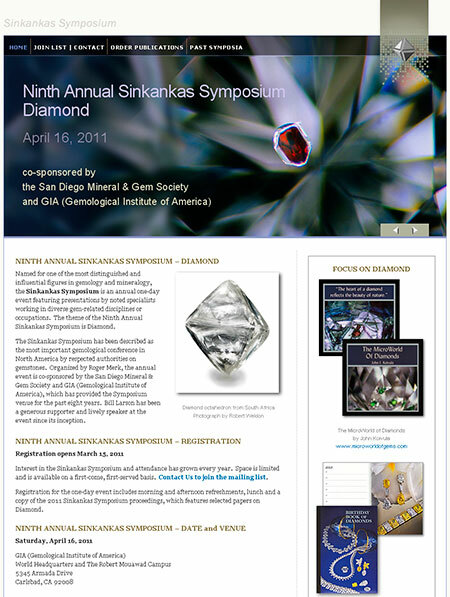 The annual Sinkankas Symposium has been described by John Koivula as the “best gem mineral symposium in North America” and never fails to achieve sold-out enrollment. This year’s topic is Diamond. The nine presenters currently slated are recognized authorities in their respective fields. Visit the Sinkankas Symposium website for speaker bios and abstracts of selected presentation topics. The conference begins its first full day of presentations, Monday May 2, with a focus on Brazil, including talks from the local host organization, IBGM (Instituto Brasileiro de Gemas e Metais Preciosos), as well as other local industry insiders. These presentations will touch on the Congress theme, “Ethical Mining and Fair Trade,” as well as environmental concerns. Tuesday’s session will focus, in depth, on the Congress theme, with topics that include corporate social responsibilities, certification by the Responsible Jewellery Council, the Kimberly Process, and ethical supply chain, with the latter subjects speaking to the conference’s sub-theme, “Certification Challenges from Mine to Market.” On both Tuesday and Wednesday traceability of origin will be discussed—in general, and vis-à-vis tanzanite and emerald. Case studies, conservation, and education and fair trade will be addressed, followed by ICA business. Presenters include: Dr. Gaetano Cavalieri, president of CIBJO; Michael Rae, CEO of the Responsible Jewelry Council; Eli Izhakoff, World Diamond Council Chairman and CEO of the Kimberley Process; Philippe Scordia of Dior Joaillerie; Robert Weldon, Andrew Lucas, and Vincent Pardieu from the Gemological Institute of America; ICA vice president and World Bank consultant Jean Claude Michelou; Douglas Hucker, CEO of the American Gem Trade Association; Gavin Pearce from TanzaniteOne; Ian Harebottle of Gemfields; Steve Bennett, CEO of Colored Rocks Limited. This month we feature a ruby from a new deposit in Mozambique. This unheated red beauty is from the Montepues (aka Montepuez) area of Cabo Delgado Province, about 225 km. north of Nampula in northeastern Mozambique. This new source came along just in time as our legal stock of rubies from Burma has been running out. Since we can no longer import rubies from Burma, these fine natural rubies from Mozambique fill a perfect niche for those in the U.S. on the hunt. This 3.16-carat exhibits the finest properties from the deposit: fine natural red hue, virtually flawless and a beautiful make. 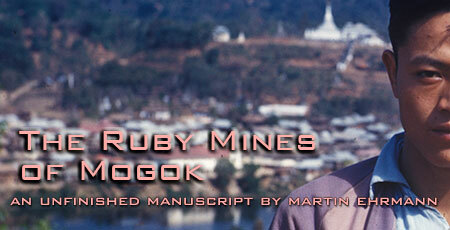 A great alternative to a Burma ruby and the pricing is quite competitive. Pala recently bought a small parcel of these new rubies. See our selection of the new Mozambique rubies here. Given the fact that most gemstone inclusions are small-to-microscopic, Koivula’s discussion of the macro level as well as the micro level should put the subject into an interesting perspective. He will describe how inclusions contribute to the value and beauty of gems, and how they can help to define the geological origins of their hosts. The lecture is being presented in conjunction with the current exhibition, Gemstone Carvings: The Masterworks of Harold Van Pelt, which closes Sunday, May 1. Someone made their valentine very happy on February 14. 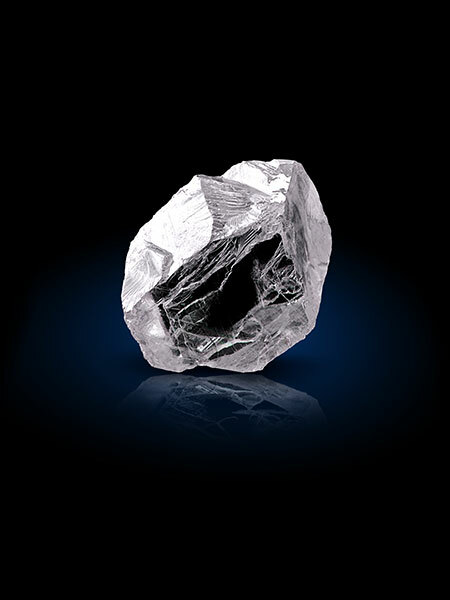 The EKATI Spirit, a 78-carat diamond crystal from the EKATI Diamond Mine in Canada’s Northwest Territories, sold for more than $2.8 million at auction in Antwerp. The crystal measured 21 x 18 x 13 mm., about the size of the top joint of a man’s thumb. 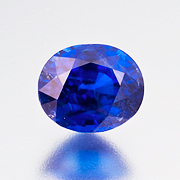 One of the largest tanzanites ever uncovered was announced on March 1 by TanzaniteOne Ltd. The 12,100-carat stone was unearthed in the Simanjiro District of northeast Tanzania’s Manyara Region, according to a story on JCKOnline. 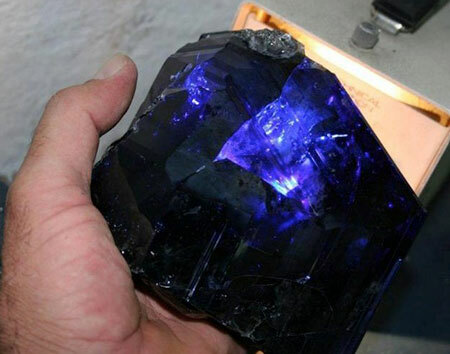 It is perhaps the third largest tanzanite ever found. Not long before the above find, the Bank of Tanzania on January 1 issued a new series of bank notes, including the 5000-shilling bill pictured below. 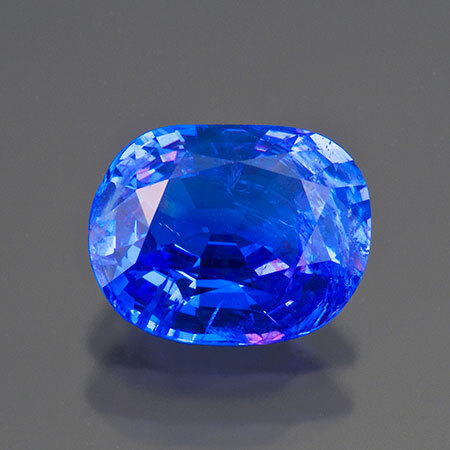 The obverse portrays a black rhinoceros; the reverse portrays the Geita Gold Mine (according to Wikipedia), and tanzanites: a crystal, and two faceted stones (misidentifed on Banknote News as diamonds). A February 11 notice from Greene Broillet & Wheeler, LLP, representing clients in the ongoing “Bahia” Emerald dispute state that opening briefs are due in court today, and reply briefs are due March 30. A date for closing arguments has not yet been scheduled. Tiffany blue. Stock prices may have fallen, but Tiffany owns its exclusive hue of blue. Just three days after LVMH (LVMH Moët Hennessy • Louis Vuitton S.A.) had been given the green light to acquire Italy’s iconic Bulgari, as reported by JCKOnline March 7, Reuters revealed that Tiffany may be the next takeover target. Then, in what is said to be a response to the earthquake in Japan, Tiffany and Co. stock fell on March 14 and 15. Japan’s luxury goods purchases are 11 percent of the global market; Tiffany receives 19 percent of its sales there, according to a story yesterday by Reuters, which also stated that other companies have been affected. Tiffany outlets are not in earthquake-ravaged areas. In December 2008, we mentioned a $102-million robbery of Harry Winston’s near Paris’s Champs-Élysées. The 15-minute job was done by four men disguised as women “with long blond tresses, sunglasses and winter scarves,” who addressed employees by name. About 80% of the haul was tracked down. The rest was recovered this month from a drain at a house in the suburb of Seine-Saint-Denis, northeast of Paris, according to the Guardian March 9. Originally suspected as being members of a Yugoslavian gang, it was determined that the robbers had spoken with banlieue (literally “suburb”) accents, leading police to one of Paris’s poorest nearby neighborhoods. 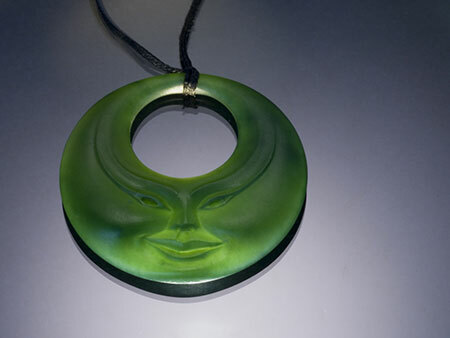 In early March we received notice of an encouraging and creative way that jewelry appraisers were supporting people in Christchurch in the aftermath of last month’s earthquake: donate all the fees you received on the day of the quake, February 22, to the NZ Red Cross Earthquake Appeal. The Association of Independent Jewellery Valuers made the appeal on its March 1 blog entry, which has received several comments from appraisers to took up the call. Colleagues are running Valuation Saturdays—including one March 19—with all fees going to the above earthquake fund, according to this Facebook page. A week after receiving the New Zealand appeal, a hemisphere away, more devastation—in Japan. Pala’s Will Larson has spent much time in Japan. Yesterday, while traveling, he shared his feelings. How does one respond to such a tragedy? I myself reacted in a defensive way. My body shut down, became unresponsive and hid from the pain, numb without feeling. Soon this turned to sadness and overwhelming emotions. Nothing like feeling so small in a time like this to make you realize what’s important in life. The last few days have taxed me; I’ve been on an emotional roller coaster hearing news from Japan in bits and pieces. Desperately trying contact friends and to discern whether they and their families were alive after the earthquake and the following tsunami. Initial contact was very difficult as most phone services were down and power was out in many areas, but thanks to social media networks and email I was able to establish contact with most of them within 48 hours. After getting through to Japan I discovered only a few were missing or hurt, most survived without a scratch just emotional scars. Sadly some are still missing; after this much time it’s not looking good. Now with the nuclear radiation explosion, it’s been tough few days. My thoughts are constantly with Japan and my friends and their families. I wrote this poem in wake of the destruction in hopes of inspiring my friends and I will share it with you. Have you seen how they come together? Last week’s 48th Annual Myanma Gems Emporium caused gem merchants to claim that jade prices have soared, according to a March 14 story posted by Democratic Voice of Burma. The prices didn’t dampen sales: a merchant was quoted as saying that jade worth 200,000–300,000 kyat ($230–$340) three years ago now was worth 1.5 million to 2 million kyat ($1,705–$2,272). Pearls also sold well. 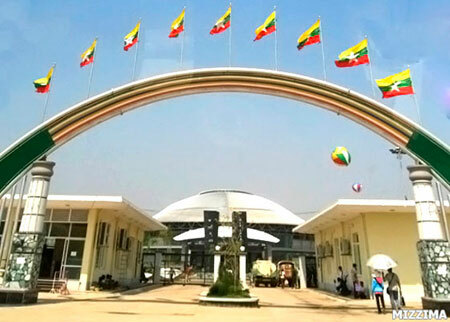 The sale is being held March 10–22 in the administrative capital of Nay Pyi Taw. An undated item by Eleven Media Group (EMG) stated that twice the amount of jade would be sold as at earlier sales. It also reported that tax would be levied on only ten percent of sales by local merchants. Another EMG story claimed that the sale would offer 16,000 jade lots, 206 assorted gems lots, and 29,000 pearls from 500 local merchants. Over four thousand foreign gem merchants were said to be attending. A third EMG article stated that 20,000 jade lots would be offered—twice the number displayed in November. Top Burma officials attended the emporium, which was reported March 9 on the front page of the state-run New Light of Myanmar newspaper, which of late has not covered such visits in such a high-profile manner. Ten photos from the emporium—some suggesting the high quality of the jade—were posted March 10 by The Irrawaddy. …but not in Japan—in China. Hundreds of Burmese jade traders fled to Burma’s border town of Ruili when a 5.8-magnitude quake struck March 10 in Yingjiang County in southwest China’s Yunan Province, according to Kachin News Group. According to the story, the market in Yingjiang is the second largest on China’s border for Burma’s merchants, who sell jade from Hpakant in Kachin State. Recovery work following the quake was covered March 14 by China’s People's Daily Online as well as a half-dozen other stories. 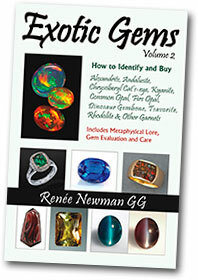 Less than a year following our review of Volume 1 of her Exotic Gems, author Renée Newman has published Volume 2. 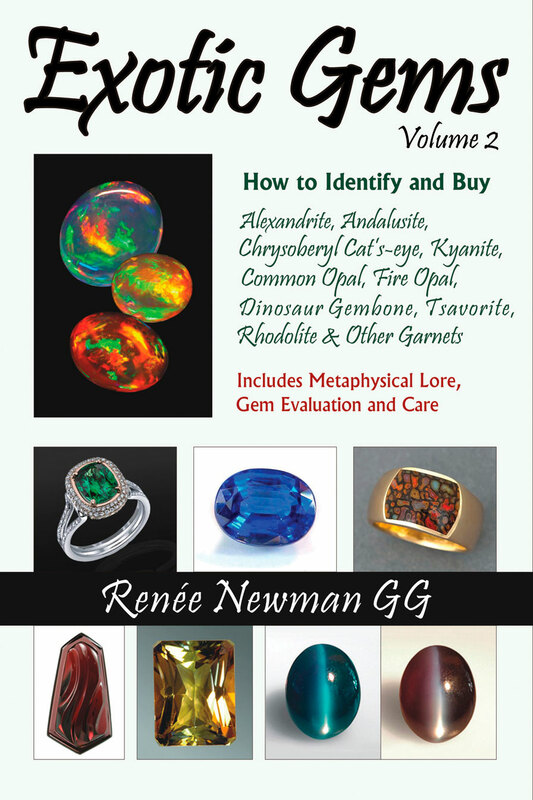 This companion volume includes alexandrite, chrysoberyl cat’s-eye, andalusite, kyanite, sillimanite, common opal, fire opal, dinosaur gembone and the garnet family, including rhodolite, tsavorite and demantioid. Newman begins the book again with a discussion of the term “exotic,” defined by one dictionary as “of foreign origin or character” or “striking or unusual in effect or appearance.” But then she asks six people for their own definitions. As a Parisienne puts it promptly, “For the French, ‘exotic’ gives rise to dreams….” Indeed, it strikes us that this is the power of gemstones, as tangible objects: to lead us through our psyches’ imaginary, and alien, landscapes. 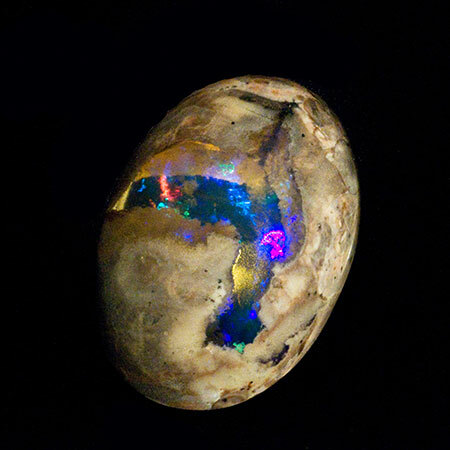 Take, for example, the image of freeform fire opals and water opal from Mexico on page 11. The colors are so radiant and near-complementary that the image becomes stereoscopic (3D glasses not needed; you’ll have to get the book to see what we mean). 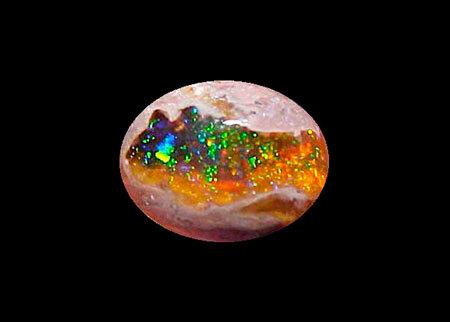 The fact that vivid opal can lurk within matrix, as Newman mentions in the section on fire opal (Ch. 10, p. 91), truly takes us on a journey to the center of our minds. 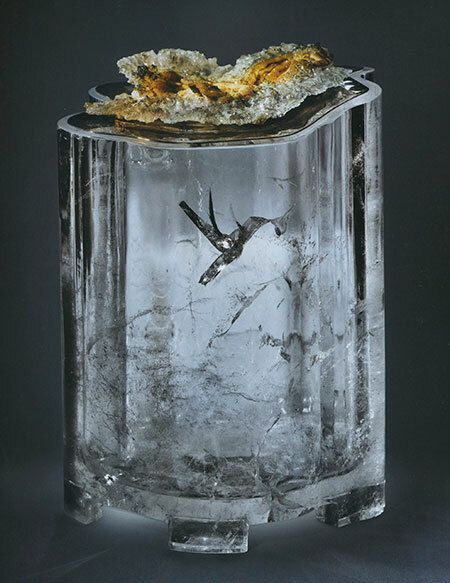 This opal in matrix above (not from the book), photographed by Pala’s Mia Dixon, compels us to look below the surface, as does the one below, photographed by Juan José Virgen for Opalos de México, included in Exotic Gems, Volume 2, p. 91. “Even though several opal books have been written,” Newman told us, “they have focused on Australian opal.” Newman saw a need for additional information on both fire (mainly from Mexico) and common opal, and therefore included two chapters on these opals. We’re happy she did: the variety of fire opals displayed and discussed abound—from the subtle rainbow effect of contra luz in otherwise glassy opal, to the coral-like formations of Pala’s July 2007 featured fire opal (included on p. 84), to treated tizate (chalk) opal that loses its intriguing inkiness when immersed in water. Synthetics, imitations, identification (and misidentification) tips also are provided, as well as descriptions of the many treatments, geographic sources, pricing and evaluation, care suggestions, and metaphysical lore (fire opal prevents burn-out!). 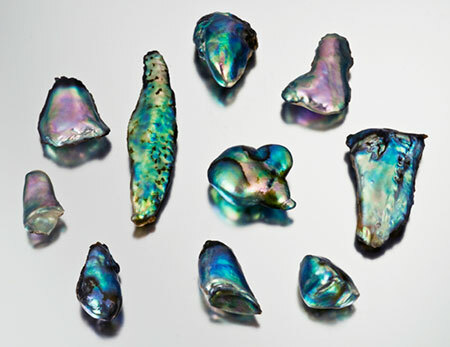 Common opal (with no play of color) moves into the realm of the exotic when one considers its many colors, such as these prase opals from Tanzania, photographed by Pala’s Jason Stephenson, included in Exotic Gems, Volume 2, p. 63. Hard to believe that sillimanite (8.21 carats, above) and kyanite (3.52 carats, Nepal, below) are often so fibrous as to be opaque. Photographed by Pala’s Mia Dixon, included in Exotic Gems, Volume 2, pp. 58, 52. This andalusite, 3.11 carats from Brazil, demonstrates strong pleochroism—naturally. Photographed by Pala’s Mia Dixon, included in Exotic Gems, Volume 2, p. 48. The last six of the sixteen chapters are devoted to garnet, in its amazing number of varieties. Chapter 11, which provides an overview of the garnet group, includes a five-page photo section showing the steps involved when master cutter Clay Zava cuts a garnet. 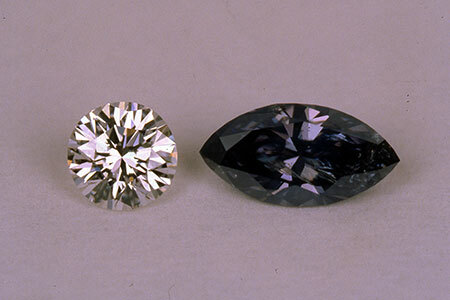 A grandite (5.37 carats, Mali, above) and rainbow garnets (freeform 56.08 carats, oval 23.53 carats, Sonora Mexico, below) are but two examples from a group that contains six mineral species used as gems. 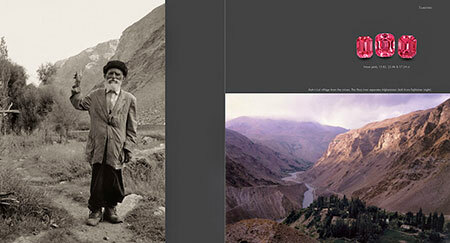 Photographed by Pala’s Mia Dixon, above, and Wimon Manorotkul, below, included in Exotic Gems, Volume 2, pp. 144, 118. The book is a manageable 154 pages—surprisingly compact given the breadth of information—with 408 color photos and photomicrographs of rough material, cut stones, and lovely jewelry, along with many helpful tables and diagrams. It also contains resources for finding an appraiser (and questions to ask), as well as a four-page bibliography. Sought after, fought over, hoarded, hidden and stolen; diamonds remain one of mankind’s greatest obsessions. 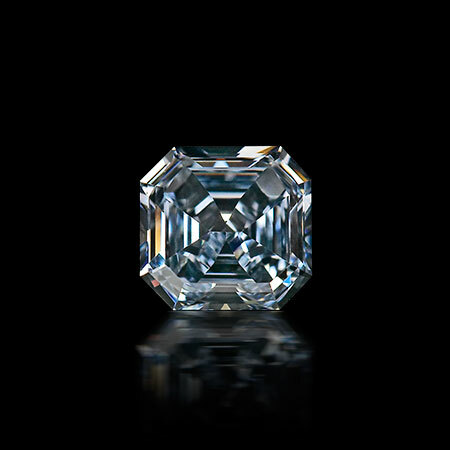 Diamond represents the most concentrated form of wealth on the planet and the hardest known natural substance. Covering everything from the origin of diamonds and their properties, through mining, the four Cs of grading and marketing, to modern high-tech treatments, fancy coloured diamonds and synthetics, The Diamond Compendium presents the body of diamond knowledge in a simple and understandable way. 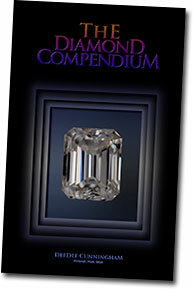 Written by a diamond expert, this book is based on thousands of hours of research with specialists worldwide. Whether you are using this book to learn the facts about purchasing diamonds, understand the trade, prepare for formal examinations or simply satisfy your curiosity, The Diamond Compendium is the most thorough, absorbing and comprehensive book on the market. About the Author: DeeDee Cunningham (FCGmA, FGA, DGA) is holder of professional diamond and gemmology diplomas from Great Britain and Canada. Recipient of multiple distinctions, she was awarded the W. Donald Goodger Prize upon graduation from the Canadian Gemmological Association in 1995. She lives in Toronto and works with her own company Burgundy & Ballantine Inc.
From the book: Irradiated and annealed blue. The book is available from the publisher and major booksellers. See also the book’s website. 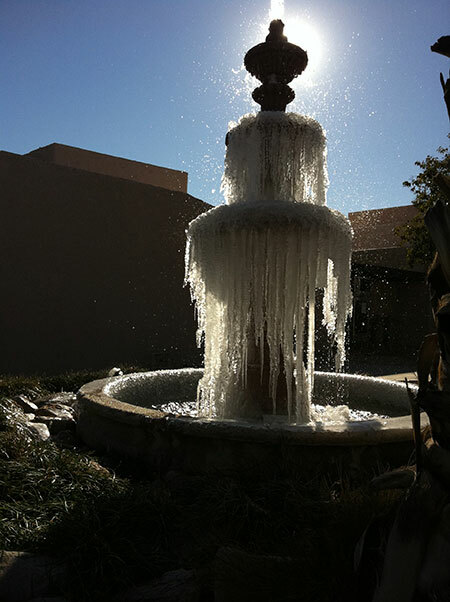 This edition of our newsletter finds us back in clement California after arctic Arizona—but we’re not complaining. Things went so well that we’re featuring a Pala first: our featured stone was sold before we could get this to press, but we thought we’d share it with you nonetheless. We’re pleased also to share with you a remarkable 34-sided tour de force, courtesy Lawrence Stoller. And you’ll be pleased, if you’re not subscribed to our sister publication, Pala Mineralis, to take a look at two books on two gemstones, one named for a little tsar, one for a little thorn. 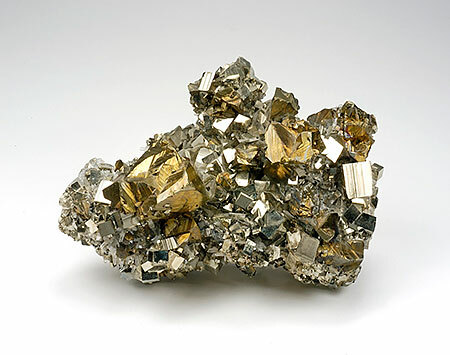 At the time of this edition of Pala Mineralis Tucson show attendees are enjoying an escape from the severe weather that grips the Midwest to the East Coast. We wish all our snowbound friends the best. 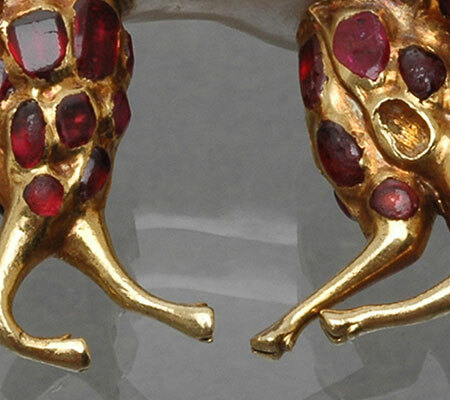 Gabrièl mentioned that Pala “also had a few very unusual stones that were held back as a treat for the avid collectors who know that we always have the fun ones stashed.” Sometimes it pays to ask... And what was hot? “Tourmaline,” Gabriél says, “was a big splash as usual,” likely given the fact that material from Mozambique is becoming rarer and rarer. 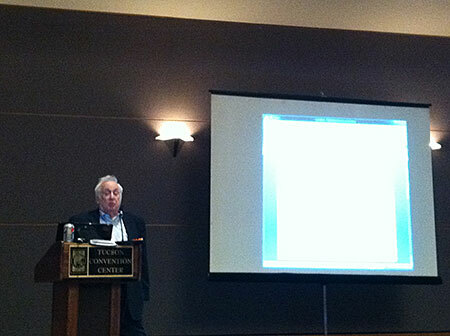 Pala’s Bill Larson spoke last Saturday afternoon to a packed house at the Tucson Gem and Mineral Show. 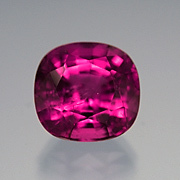 Spinel has become increasingly popular, due in part to all the wonderful natural colors it produces. 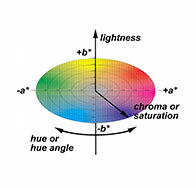 The more common colors are the red hues with secondary colors mixed in—like orange, purple and pink. 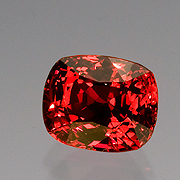 To find pure red in spinel is probably even more rare than finding a pure red ruby. There just simply aren’t as many spinels coming out of the ground, so to find pure and intense natural colors seems to be on the wish list for many new collectors. 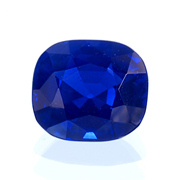 When we shift over into the blue hues the scarcity increases and we weed through many over-dark grayish-blue spinels until we find these blistering cobalt-blue jewels. 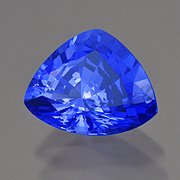 In fact, we even had this most recent blue spinel (above) tested for cobalt at the Tucson show, at the GIA Show Service Laboratory. In the end the lab was able to find the presence of cobalt through the Chelsea filter, which glowed cherry red when illuminated. This collector’s dream really didn’t even have a chance of making it into our inventory; there was a line of people who wanted it and it has already found a home. However, we still wanted to share the excitement of such a spectacular and rare gem with our loyal readers. Interested in something similar? Call or email us to inquire. SSEF Swiss Gemmological Institute has released its annual compendium of gemological information, Facette. This edition includes the following topics. The latest export statistics were released February 1 by the Trade Development Authority of Pakistan, covering the last six months of 2010. The total for gems and jewelry combined saw a drop of 19.3%. Gems alone increased by 3.14%, while jewelry declined by 19.42%. Gems are a tiny fraction of the total—$1.5 million versus $286 million for jewelry. Both sectors missed their targets, gems by 25% and jewelry by 22%. Statistics were on the lips of Pakistan’s Federal Minister for Industries and Production, Mir Hazar Khan Bijarani, as he opened a two-day Gem Bazaar early last month in Islamabad. The minister announced an ambitious target of increasing “gemstones” exports (presumably also including jewelry) from $300 million to $1.5 billion by 2014, according to a January 6 article in Dawn. 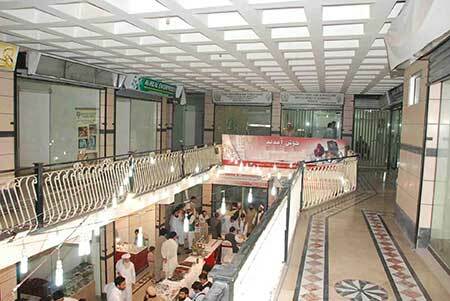 Gem Bazaars take place often at the Gem Exchanges of Peshawar and Quetta, as well as at the training and manufacturing center at Lahore. January’s sale was the first in the capital of Islamabad. Exhibitors from across Pakistan included about 125 dealers, distributors, exporters and retailers. The Pakistan International Gems and Jewellery Exhibition, scheduled for last August, was postponed due to massive flooding in the country. A February 4 article, also in Dawn, quoted figures released by China Customs: exports to China from Pakistan rose by $500 million during calendar year 2010, to $1.7 billion from $1.2 billion in 2009. To help solve a trade deficit with China, according to the article, Pakistan has requested vocational and technical training in gems and jewelry. 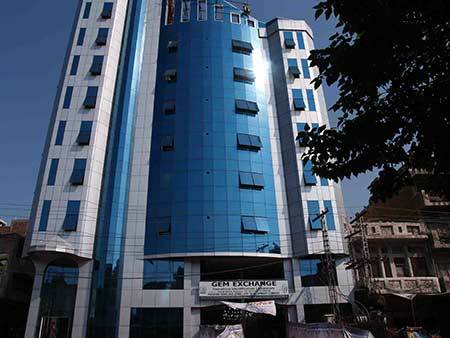 Eleven Media Group (EMG) reported in an undated story that 40,000 pearls would be offered at a pearl emporium that was to be held January 11 to 13 in the administrative capital of Nay Pyi Taw, at the Myanma Gem Museum there. They were to be offered via tender and bidding in kyat currency. According to the article, this emporium was the fourth to be held in Nay Pyi Taw, and the 30th held in Burma. Post-sale results were not located. Natural spinel from Burma, 4.54 carats, from our Old Stock… New Pix, courtesy Pala photographer Mia Dixon. Another EMG story looked at the Yangon tourist spot of Bogyoke Aung San Market (named after the father of Aung San Suu Kyi, who fought for Burma’s independence). The market “is now teeming with world tourists,” according to the article, after a mid-year slump that continued through last fall’s general elections, but picked up during the Christmas/New Year holiday season. Window shopping, isn’t buying, however, and sales have not yet increased. Some gem merchants interviewed at the market by The Myanmar Times (MT) were quite optimistic about the tourism resurgence. One merchant even felt that the market in Nay Pyi Taw—in addition to those at Bogyoke and Mandalay—was a boon, allowing him to purchase rough stones in the capital, polish them in Yangon, and then sell them again in Nay Pyi Taw. “I tripled my money on those gems,” he told MT. 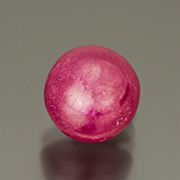 Natural Burma ruby, 6.7 carats, also from Old Stock… New Pix. But a sort of a corundum conundrum has surfaced at the market—the kind that would make Lawrence Stoller wince. While tourists “seem to value handmade works” and love to watch traditional hand-polishing methods in the market, domestic buyers prefer machined gems. The fear amongst industry insiders is that Burma’s hand-faceting could be eclipsed by industrialization of the craft, leaving Burma in the dust created by China and Singapore as those countries march forward on the Path to Progress. According to Xinhua News Agency on Monday, Nay Pyi Taw hoteliers are still preparing for the 13-day gems emporium to be held March 10–22. But buyer beware if you add gold to your shopping cart: Burma’s customs department has restricted how much gold jewelry that air passengers can take off with. And a “gold ring shall not be inserted with any kind of gem or jade stone,” according to the article, which referred to a February 3 story by Yangon’s Popular News. The issue of sanctions against Burma has become such a hot topic in the weeks since the release of Aung San Suu Kyi, that even the non-governmental (but tightrope-walking) online weekly The Myanmar Times has taken up the issue, as it did in its current edition. It seems everyone is critiquing the wisdom of continuing bans that even proponents admit aren’t working. For instance, Democratic Voice of Burma last month published an analysis titled “Sanctioning sanctions?” that provides a history of the tactic vis-à-vis Burma, observing that sanctions have been applied usually as a reactive measure, and concluding that only “targeted” sanctions (e.g., against banks) could impact the country’s regime. We’re pleased to reprint the following two items, which were featured earlier this month in our bimonthly sister publication, Pala Mineralis. In September, we featured a notice regarding the impending publication of Russian Alexandrites by Karl Schmetzer (with contributions from George Bosshart, Marina Epelboym, Lore Kiefert and Anna-Kathrin Malsy). For this edition of our newsletter we thought a scholar's perspective on the volume might be interesting, so we approached Lisbet Thoresen, whose own work on gemstones, especially their historical background—discovery, naming and use—are prominent topics in this book. The history of alexandrite has been shrouded in mystery and obfuscation since its discovery in the Urals, Russia, in 1833. 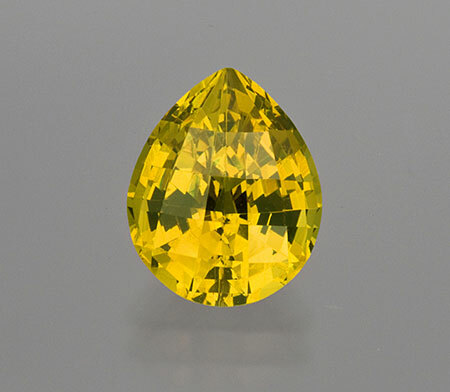 Despite its commercial value and desirability as a rare collector gemstone, mineralogical studies on this color-change variety of chrysoberyl, especially the Russian material, have been limited until recently. 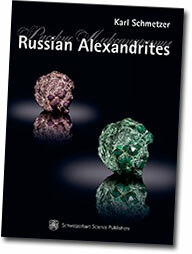 In 2010, Dr. Karl Schmetzer produced a comprehensive and authoritative book on this subject entitled Russian Alexandrites. For the first time, this book reconstructs an accurate history of the gemstone through original letters and reports translated from Russian, French, Swedish and German, as well as historical photographs obtained from obscure archives. This book also provides an insight into the study of minerals of the 1830s to 1850s, when mineralogy was just beginning to become a science. Ever since its discovery, access to material for study has been difficult, which may explain, in part, the paucity of mineralogical data published to date. 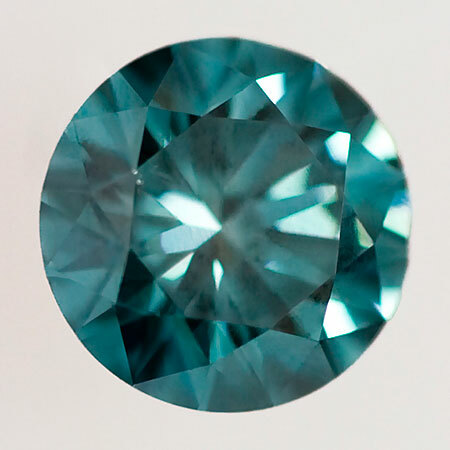 The historical background on alexandrite, however, has been richly embroidered—from its actual date of discovery to its recognition and correct characterization as a distinctive new variety of chrysoberyl. The mining operations from the earliest ventures until the present day, likewise, have a storied history, much of it obscured under the cloak of secrecy during the Communist era. 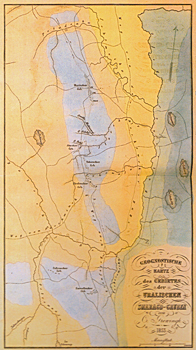 The first geological map of the emerald and alexandrite mining areas north and south of the Tokovaya River was published by Grewingk in 1854. Marina Epelboym and Karl Schmetzer frame the story first by describing the geological setting in which chrysoberyl and alexandrite (and also phenakite) were discovered—as associated minerals in the emerald bearing zones of the Izumrudnye Kopi belt, or Tokovaya area, northwest of Ekaterinburg, which, after Colombian sources, are the most commercially significant historical emerald deposits in the world. 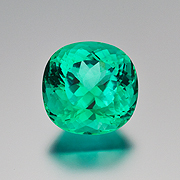 Always regarded as a secondary mineral to emerald, Schmetzer estimates the ratio of emerald to alexandrite ranges between 100:1 and 200:1. Because the primary mining interests focused on emeralds, the history and development of the Russian mines where alexandrites were first discovered inextricably interweaves the story of alexandrite with that of some of the most important emerald specimens ever found. This aspect of alexandrite’s history is taken up in the book’s next chapter by Schmetzer. The principal author provides a fluid narrative relating the history of the famous emeralds recovered from the Tokovaya area and their passage through the hands of illustrious collectors and museums, including the Kokovin emerald, a 400 gram emerald that was lost or stolen in 1835; the Leuchtenberg emerald druse, a group of 20 crystals en matrix found in 1831 and weighing 6265 grams (first published by von Pott in 1842); the Kochubei emerald, found in 1831 at the Sretensky Mine and weighing an astounding 2226 grams. 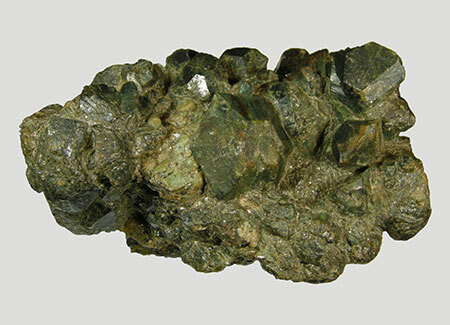 Among the alexandrite finds, the most important ones were all discovered prior to 1840, and pre-eminent among them is a crystal group known as Kochubei’s druse (pictured below). Also in this same chapter, Schmetzer chronicles the discovery, naming and uses of Russian alexandrite in the 19th century. 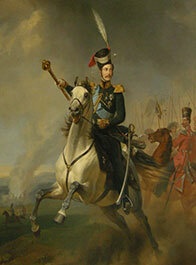 Named in 1842 in honor of the Tsarevich, the future Tsar Alexander II of Russia (r.1855–81), the author also presents the correspondence, publications, photographs and drawings that establish an accurate timeline and context concerning alexandrite’s early history. 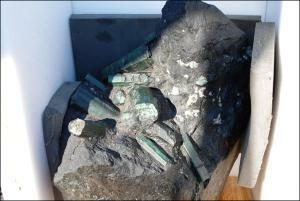 In 2005, the Tsar Emerald Corporation, a Canadian company, secured licensing agreements to operate the Malysheva Mine, one of the seven principal mining sites which were discovered prior to 1840. In 2007, Dr. Schmetzer and Dr. Lore Kiefert were able to visit the mine and perform the first mineralogical studies on specimens that had been unearthed after 2000 from the Malysheva Mine. 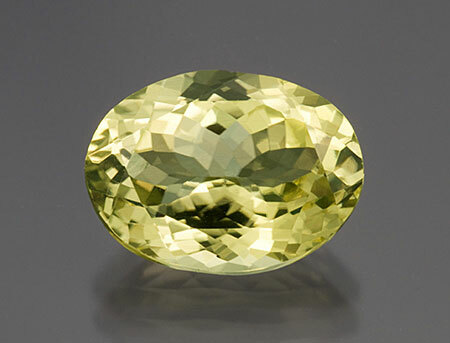 As volume editor and principal author of Russian Alexandrites, Schmetzer has drawn together data gathered on alexandrites and yellowish green to yellow green chrysoberyls in various collections, both private and public, in Russia, Germany, Austria and Great Britain—covering material from a time period spanning more than 175 years. Gemological, mineralogical, morphological and colorimetric data are presented in separate chapters, each detailed and copiously illustrated with color plates, photomicrographs, spectra, schematic diagrams, plots and charts. Chapter 6 presents gemological and mineralogical studies performed by Schmetzer and Kiefert, which employed analytical tools, including electron microprobe, SEM-EDX, energy-dispersive X-ray fluorescence (EDXRF) and micro-Raman spectroscopy in order to obtain quantitative data and corroborative identification of inclusions. Numerous photomicrographs complement the discussion of alexandrite’s inclusions, distinctive growth structure and twinning. Beginning with a discussion of the early work of mineralogists on the recent finds from the Central Urals, in Chapter 5, Schmetzer presents an in-depth examination of the morphology and twinning in chrysoberyl and especially alexandrite, elaborating in detail the distinctive habit of single crystals, single contact twins and cyclic twins or trillings. Numerous drawings by the author and photographs of historical specimens illustrate the discussion on the morphological variations of crystals originating from the Tokovaya area. Chapter 7 is devoted to an investigation into the nature of chatoyancy in alexandrites and chrysoberyls from different gem-producing regions of the world, as well as the rare phenomenon of asterism in chrysoberyl from Sri Lanka—a subject that has received scant attention previously. 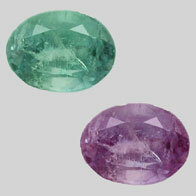 Chapter 8 compares the growth patterns of natural alexandrite and its synthetic counterpart. The last chapter, authored by Anna-Kathrin Malsy, discusses origin determination and the use of several analytical tools, primarily laser ablation inductively coupled plasma mass spectrometry (LA-ICP-MS) to obtain trace element chemistry in specimens from Russia; Hematita, Brazil; India; Sri Lanka; and Lake Manyara, Tanzania. Operating conditions and data acquired are described and characteristic features useful for making separations are discussed. This chapter, featuring ternary diagrams and plots, is a useful benchmark for future studies on chrysoberyls and alexandrites from other localities. 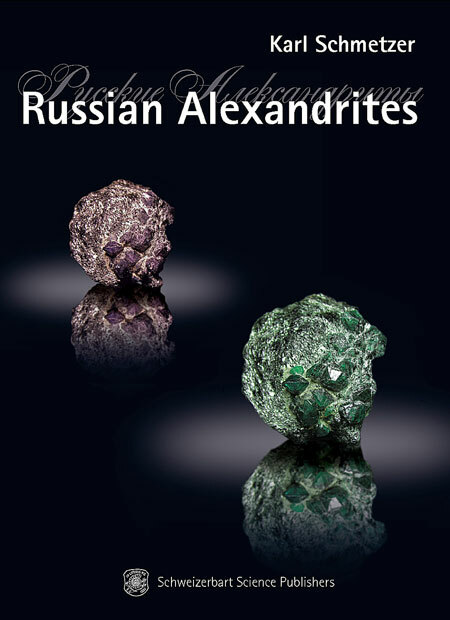 This volume aims to be a handy reference as much as it aims and succeeds at being a meticulously detailed and comprehensive work on Russian alexandrite: the Appendices and Timetable feature tables on primary mining localities, physical data on alexandrite and green chrysoberyls, English-German transcription of significant names and milestone events. The achievement of this book is not only its exhaustive treatment of the subject, unprecedented for the scope and detail presented, but also its historicity. It is a fascinating chronicle of alexandrite’s Russian origin and labyrinthine odyssey through time—a painstakingly researched story replete with intrigue, tragedy and epochal sweep worthy of translation to motion pictures. Such a rare and special gemstone deserves no less than the able and thorough treatment it receives in this book. Lisbet Thoresen is an independent scholar specializing in gemological and archaeometric studies on gems of the ancient world. Previously, she was Associate Conservator of Antiquities at the J. Paul Getty Museum, where she worked on all aspects of the preservation, analysis, authentication, and conservation of the collection, including glyptic art (carved gems). She is volume editor and principal author for the book (forthcoming), On Gemstones: Gemological and Analytical Studies of Ancient Intaglios and Cameos. Note that you can save shipping charges on this book by visiting booths at the Hong Kong and Baselworld shows in March. They’re listed at the bottom of the SpinelBook.com home page. 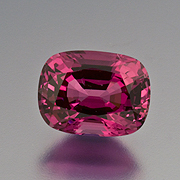 As this month’s featured stone demonstrates, Pala International has long appreciated the beauty of fine spinels. The Palagems.com catalog contains 220 stones, in a variety of hues: blue, purple, gray, orange, brown, pink, red—even an inky green. Strange then, how award-winning gemologist and author Richard W. Hughes, in his announcement of a new monograph on the stone, would remark, “And yet few know its name and fewer still understand its importance. This is truly a tragedy….” We now can put all of that in the past tense. 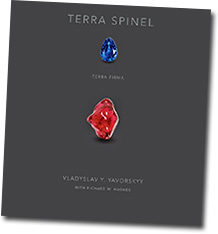 Terra Spinel – Terra Firma is a new book by Bangkok-based dealer Vladyslav Y. Yavorskyy, with the aforementioned Richard Hughes. Our personal copy, we’re told by Mr. Hughes is on a slow boat from China—literally—as he now resides in Hong Kong. The contents have nonetheless been sampled in tempting helpings at SpinelBook.com. When we spoke with Hughes prior to his announcement he was quite enthusiastic about the book’s quality: 200 hardbound pages of six-color process printing, with spot varnish giving the gemstones a special sparkle. But then, many of you already have sprung for a copy in the big tent at Tucson’s GJX Show, booth 404, 504. Happy New Year to our readers, contributors, and clients! We begin the year by remembering the late Dr. Kurt Nassau, upon whose foundation so many gemologists (and others) build. We look toward Tucson next month and back at Chicago last fall. Our featured stone hails from California and our featured book from Qatar (sort of…). Research takes us around the world, and La Niña takes us from shore to shore to shore. See the links below on Palagems.com for Pala International’s location at the following Tucson venues, and for other show details. One-stop general information about individual shows can be obtained from the Tucson EZ-Guide. Scottish gemologist Alan Hodgkinson and outgoing Gems & Gemology editor Alice Keller will be honored at AGTA’s 30th Anniversary event, February 1, 6:00 p.m., at the Tucson Convention Center. Hodgkinson will be awarded an Honorary Membership and Keller will be recognized for her many years of service. 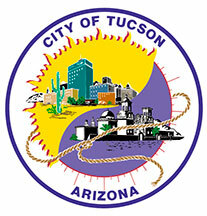 The anniversary celebration is being sponsored by the City of Tucson and will be located in the new East Entrance of the Tucson Convention Center on the opening day of the GemFair. All registered GemFair attendees are invited to attend. For more information, see this January 12 press release. 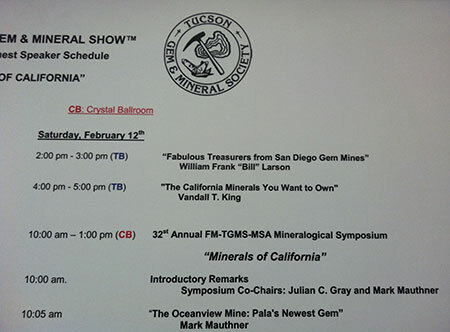 In keeping with its theme, “Minerals of California,” the 2011 Tucson Gem and Mineral Show will feature Bill Larson speaking on the topic of California tourmalines. When: Saturday, February 12, 2011, 2:00–3:00 p.m. 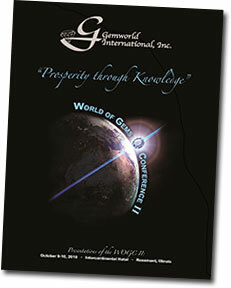 Proceedings of last October’s World of Gems Conference II are now available for purchase. The post-conference booklet contains abstracts of the research presented by sixteen experts, accompanied by a liberal helping of images. A January 5 press release from conference organizer Gemworld International, Inc., describes some of the highlights. Conference speakers covered an extensive range of topics including tracing developments in gemstone enhancement over thousands of years in the History of Gem Treatments and Nomenclature, to lessons in the fundamentals of diffusion in Of Beryllium and Beef Steak: Understanding Diffusion in Gemstones. Diamond source and identification research topics were addressed in the sessions: Treated Diamonds and Lab Grown Diamonds and a lively panel of industry personalities debated Diamond Fluorescence—Controversy and Commerce. Presenters representing the GIA, AGL, Gubelin, and AGS as well as notable industry professionals including Dr. John Emmett of Crystal Chemistry, provide a wealth of gemological information. These illustrated abstracts contain the heart of each presentation from: Applying the Scientific Procedures to Lab Reports to Current World Sapphire Source; Inclusions and What They Reveal about the Stone; Selling the Legal Way to Pearls Varieties and Identification. Warranties and Lab Reports presented by an attorney specializing in jewelry industry issues discusses the guarantee you might be making by handing your customer a third party lab report. This post conference book is an important addition to the reference library of today’s professional appraiser, gemologist and retailer. Staying in suit with the theme of this year’s Tucson Gem and Mineral Show, we are featuring the state gemstone of California. A monster in terms of the benitoite species, this 4.22-carat gem exhibits not only great size but also intense purplish blue color. 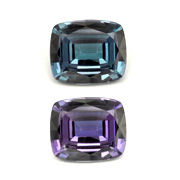 This mixed cushion-cut jewel also throws out a little dispersion and shows some color banding seen as purple, blue, and white patches in the gem photo. 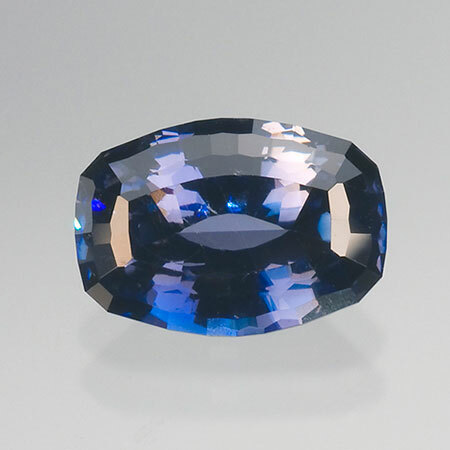 This banding is also seen in the benitoite crystals with a purplish blue outer rim and a white center. As you’re probably aware, large crystals and fine faceted benitoites are really only found in San Benito County in Central California. The story goes that a couple of copper prospectors serendipitously spotted the shiny blue gems on a weathered-out hillside one morning in 1907. 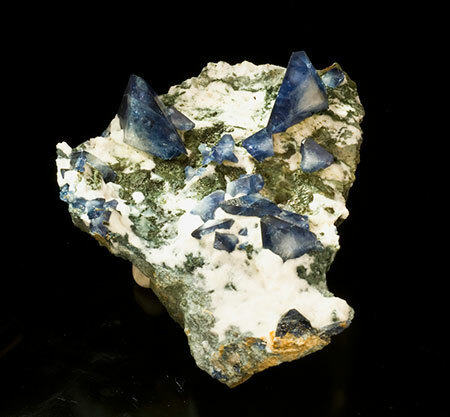 Further investigations and several mining projects later, benitoite was unearthed and poised as California’s state gem. Interested? Select the inventory number above, call, or email us to inquire. 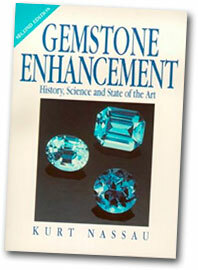 Kurt Nassau, Ph.D., author of eight books, including two editions of the classic Gemstone Enhancement, died in Lebanon, New Jersey, on December 18. According to a newspaper obituary, Dr. Nassau published over 450 articles and held 17 patents. Early in his career, he joined Bell Laboratories, where his years of crystallographic research led to the publication of a brief monograph, Growing Synthetic Crystals (published by Bell in 1964), and 1980’s Gems Made by Man. 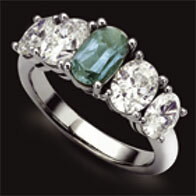 Gemologists still refer to his Gemstone Enhancement, published in 1984 and 1994 editions. In his email-exclusive newsletter, Gary Roskin recounted personal memories of Dr. Nassau. While it had been a few years since we had last been in contact with Kurt, no matter what he was doing, he always made time for the gemologist/reporter’s question regarding treatments and synthetics. However, getting a straight answer from him wasn’t always that easy. Being the consummate teacher, one had to go through a series of short quizzes in order to have the question answered. Getting the right answers to those little quizzes wasn’t the point of his testing. Nassau just wanted us to learn, and more importantly, understand the science behind the gemological tests. 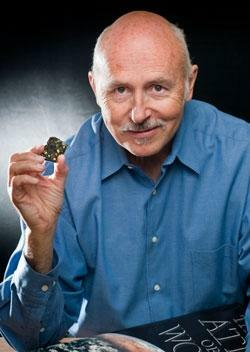 An October report co-authored by Dr. Peretti contained a reference to “a very elaborate hoax,” which was seized upon by another Tucson 2011 presenter, Robert James (International School of Gemology), who surely will touch upon the subject in his “Forensic Gemology and the New Generation of Treatments” at the Tucson Gem and Mineral Show (TGMS). …and including a letter prepared by China for the GILC discussion. Yes, the government’s National Gemstone Testing Center sent its own team to yet more apparently-salted andesine fields last spring. But don’t look for it on the lab’s website; the English-language section hasn’t been updated since 2006. The team’s report is being issued in Letters to the Editors of the forthcoming edition of Gems & Jewellery, published by Gem-A, The Gemmological Association of Great Britain. Carat Gem Lab: Last month we looked at an unusual “insect” inclusion in diamond, and we touched on fluorescence in October. Dr. Eric Erel of Carat Gem Lab brings both together in his overview of diamond inclusions, “Inclusions Explained,” published last March in Rapaport Diamond Report. 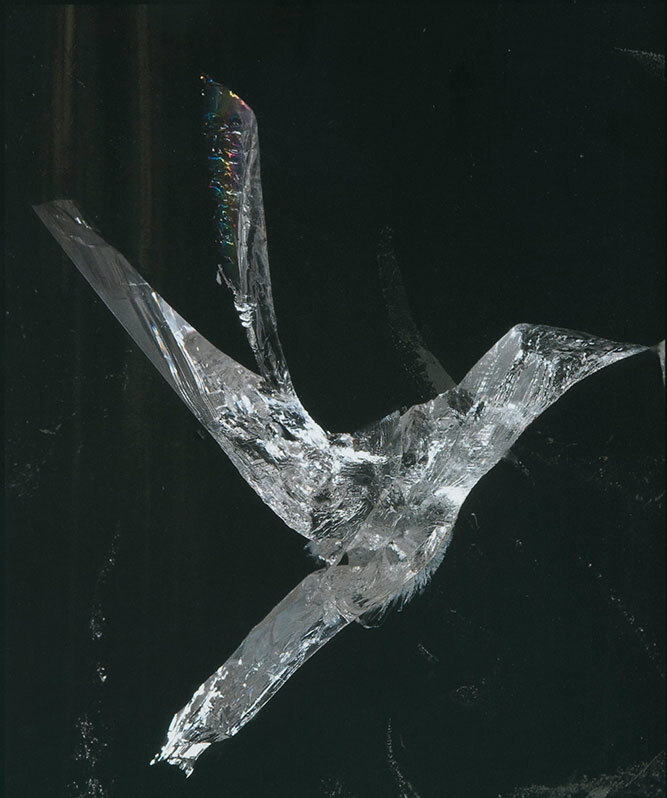 In his 2009 “Clarity Treatments for Diamonds,” published in The Journal of the Gemmological Association of Hong Kong, Dr. Erel includes a photomicrograph of another vaguely insect-shaped internal fracture (Fig. 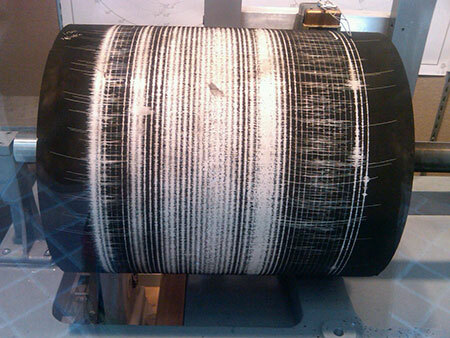 2), which was treated by a drill-hole method for dissolution of undesirable internal features. GIT-GTL: “Unusual Cultured Pearls” was issued by The Gem and Jewelry Institute of Thailand Gem Testing Laboratory (GIT-GTL) and actually concerns three Australian baroque pearls that were purported to be natural. X-radiography of the three revealed both radial and void structures that may be found in natural and non-beaded cultured pearls, respectively. Gemstone Information Manual: Earlier this month, the tenth edition was issued of this “industry information guide for natural gemstones, enhanced natural gemstones, and man-made stones.” According to a January 7 notice to its members, ICA has agreed to adopt the disclosure codes outlined in the manual, which previously had been used by AGTA and CIBJO, the World Jewellery Confederation. Access a PDF of the manual here. SSEF: Traveling with time on your hands for a hands-on experience? 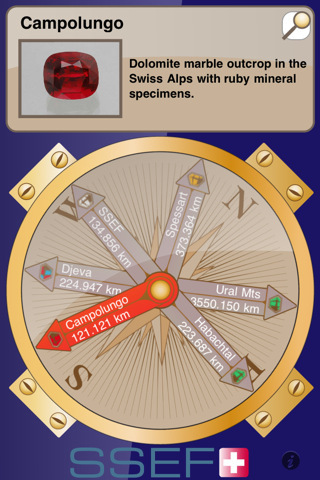 Swiss Gemmological Institute (SSEF) has launched an iPhone app (pictured below) that provides the six closest gemstone-producing areas for a given location. 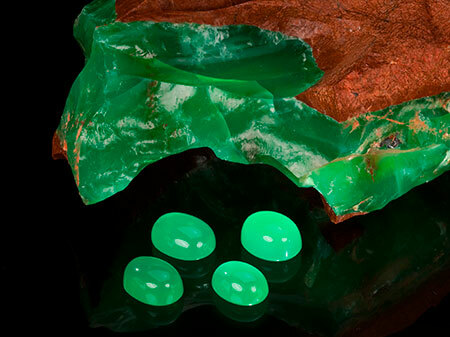 The application, GemExplorer, “also provides a search function based on different gemstone categories,” according to a January 12 press release. The app is free from iTunes. We’ve been informed that SSEF’s annual Facette e-journal (No. 18) will be published about this time next month. When you visit the website of the Blue Hollow Mine in Australia’s Queensland, Peter and Debbie Chalmers greet you with the reassuring, “We have recovered from the flood and are open for business.” Scroll down, however, and you’ll see a link to photos from flooding in January 2008, during the last La Niña phenomenon (a dropping of surface temperature in equatorial eastern central Pacific Ocean that can cause meteorological mayhem). In early December, the Gemfields area of central Queensland experienced heavy rainfall—between 4 and 8 inches in a single overnight drencher, causing roads to be closed and flooding of homes. The towns of Sapphire and Rubyvale were cut off. Rains appear to have abated—only three quarters of an inch was predicted for each of Monday and Tuesday. When we queried Francine Payette, chair of The Australian Gemmologist, she told us that the country’s opal miners have not been affected. But I have to admit that at the time being I am more worried about the well being of my friends and colleagues of the [Gemmological Association of Australia] (close to 250 members live in Qld) than about flooded mines. 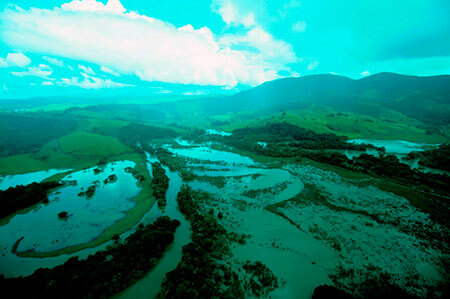 The Government of Queensland declared that 75% of the State is considered a “disaster zone”. The El Niño/La Niña phenomena were “originally recognized by fisherman off the coast of South America,” according to the National Oceanic and Atmospheric Administration. So it’s perhaps not surprising that Brazil, on the other side of the continent, was hit with flooding rain in the state of Minas Gerais. Gemstone mining areas in the northeast of the state appear to have been spared by the weather. But the southern part of the state, as early as January 7, had lost 16 people, with 14,400 made homeless, according to BBC. Recently, the body of gemological literature has been vastly enriched by the addition of what can only be described as a sumptuous and lovingly produced book entitled simply Pearls. Written by Hubert Bari (author of Pink Pearl: A Natural Treasure of the Caribbean) and David Lam, Pearls was published to coincide with the exhibition by the same name, held from January to June 2010 at the Museum of Islamic Art in Doha, Qatar. Both the book and exhibition were financed by the Qatar Museums Authority (QMA), chaired by Her Excellence Al-Mayassa bint Hamad bin Khalifa Al-Thani. 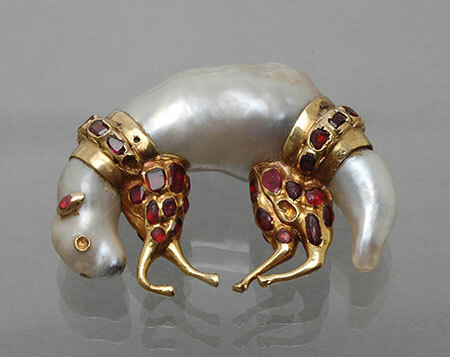 The holdings of Qatar comprise possibly the most extensive assemblage of natural pearls in the world, as well as historical documents, jewelry, and relics of a once vibrant pearl-fishing culture. Through the exhibition and book, the authors and the QMA bring to the wider world this amazing treasure of nature, culture, science, and beauty. Pearl Salad. 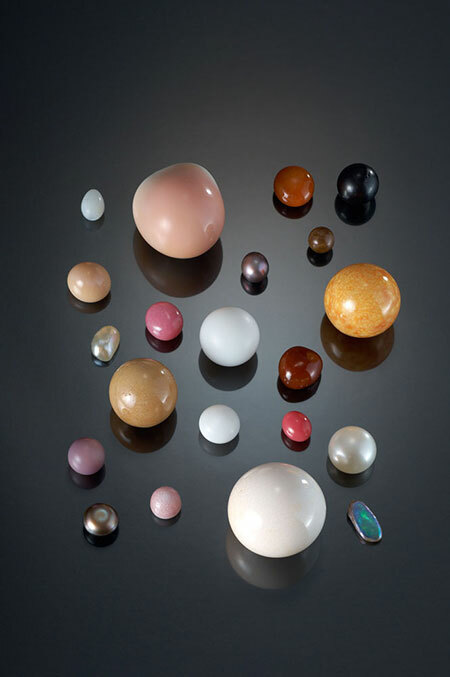 Natural pearl treasures from the Qatar Museums Authority in Doha, Qatar. Measuring 28.73 mm. and 111.5 carats, the rarest of all is the large salmon-colored pearl at the top; the only known pearl of the emperor helmet (Cassis madagascariensis) from Florida. (Photo: Christian Creutz, courtesy of Hubert Bari and David Lam. See key below). 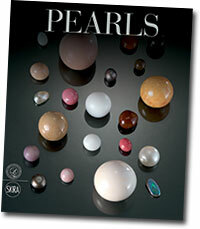 Pearls is destined to become a classic tome on the subject of natural pearls and makes a very fine companion to Elisabeth Strack’s comprehensive text Pearls (Perlen), scientific journal papers, as well as historical texts such as The Book of The Pearl by Kunz and Stevenson. Written in an accessible style for the layman, it draws on the expertise of not only its authors, but also the leading-lights of pearl research. The authors and QMA acknowledge an impressive list of such people and institutions, while the book reflects this in the depth of knowledge conveyed by its text and imagery. In fact, it is the imagery which first attracts and singles this book out. As one’s fingers graze its smooth pages, the sensuous portraits seem almost holographic, tempting the reader to gather the pearls off its leaves. The breathtaking portraits by Christian Creutz, Jeff Scovil, and others, along with images both historical and contemporary, make this as much an art book as a reference text. Readers will see (for the first time in many cases) natural pearls of extreme rarity alongside the molluscs which birthed them; not only oysters and mussels, but also nautilus, conch, volute, murex, clam, and many others. Photomicrographs by John Koivula and scanning electron microscope (SEM) images and pearl sections provided by Dr. Henry Hänni help the authors unravel the mystery of these pearls’ unique optical properties and genesis. The 336-page book is broken into seven sections: “The Nature and Formation of the Pearl”; “Pearl Molluscs”; “The Pearl, a History of Indifference and Passion”; “The time of the Great Fisheries (1850–1940)”; “The Culture of Pearls”; “Gentlemen-Farmers”; and lastly, “Chanel and Pearls.” The last four sections provide a cultural and historical context for these small wonders, with intriguing insights and fascinating images drawn from antiquity to the present. For the present writer (EAS), the over 100 pages comprising the first two chapters are the most precious for they are the ones which, with 120 photographs, provide a fantastic view into the world of natural pearls of every variety. Pearl aficionados, gemological bibliophiles, natural history buffs, and humanists alike will all appreciate this book and, with its surprisingly reasonable pricetag for a hardcover book of its quality, this gem is an easy choice. As the timely appearance of the Bari and Lam book might suggest, there is a renewed and growing interest around the world in natural pearls. Historically pearls have been coveted by many cultures and in many time periods, especially those from the familiar oyster. Today, connoisseur pearl collectors (a rarified community in itself) seek out the rarest examples and those which exemplify the type. 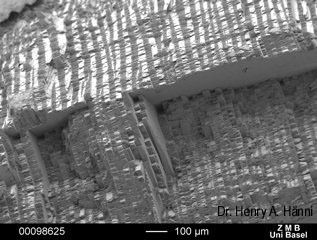 Above, Dr. Henry Hänni reveals the intricate structure of lath-like aragonite crystals responsible for melo pearl’s characteristic flame structures (SEM image courtesy of Dr. Hänni). But who defines the type and where does one turn to learn about these highly unusual objects—each one unique even within its own species? 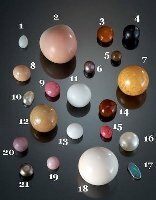 These were questions we at Cornell University were faced with more than a year ago when curating a small but diverse collection of odd little pearls, some hardly recognizable as such, so little did they resemble the classic variety! As we studied them, their phenomenal optical properties and physical structures started to reveal themselves and our fascination grew, both with the pearls themselves and the potential relevance to an educational environment. Reaching out to the original owners of these pearls (K.C. Bell and others) provided insights into the provenance, while a literature search led down many paths…many ending with the usual suspects: the research of Ken Scarratt, Henry Hänni, Emmanuel Fritsch, Stephen Karampelas, Elisabeth Strack, Nicholas Sturman, and Antoinette Matlins—to name just a few which readers might recognize—but also to researchers in the world of bio-mineralization whose work may be more obscure to the casual reader (see this bibliography). We first turned to Professor Dr. Hänni of the Swiss Gemmological Institute (SSEF), who has spent a lifetime teaching and researching in the field of gemology. Dr. Hänni’s special love of pearls (and maw-sit-sit, but that is another story), has led to a wealth of scientific papers, the latest of which is to be found in the most recent issue of the Australian Gemmologist, “Explaining the flame structure of non-nacreous pearls” which discusses that most coveted feature of conch and melo pearls: the chatoyant-like flame structure. Our interest in the polymorphs aragonite and calcite (which produce the optical effects seen in pearls of many types) was piqued by his discussions via email of their properties and the SEM images he shared with us. Perhaps even lesser known than the pink pearl produced by the queen conch, melo pearls turned out to be a unique study specimen for us. While one of the best books on this subject is the 1999 The Pearl and the Dragon: A Study of Vietnamese Pearls and a History of the Oriental Pearl Trade, a wonderful and easily accessible resource is to be found on the Pala website: “Melo Pearls from Myanmar,” summarizing the 2006 International Gemological Symposium poster presentation of the same title. More questions arose and more opportunities soon presented themselves. K.C. 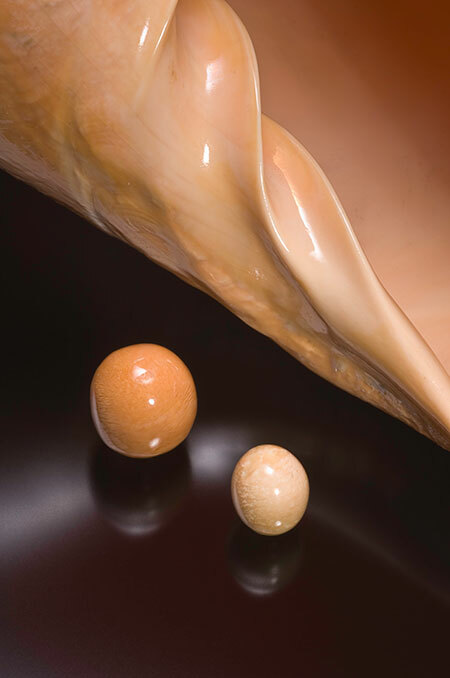 Bell offered for study a fascinating melo pearl simulant pictured above to which we could compare the real melo pearls with the properties of the shell. Continued guidance from Dr. Hänni, along with online conversation with GIA Bangkok’s Nick Sturman (who had recently given a Gemstone Gatherings presentation on melos) make us optimistic that we will be able to make our own SEM images this spring and further explore for ourselves these fascinating microworlds. As we noted in November, this year’s Accredited Gemologists Association conference at Tucson will feature two of the experts mentioned above by Elise Skalwold. 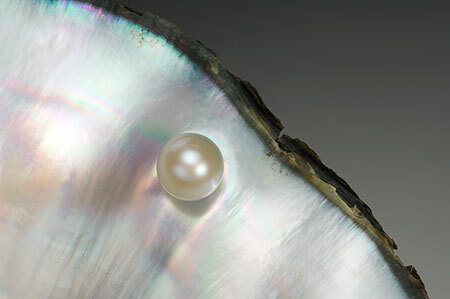 Elisabeth Strack and Ken Scarratt will speak on pearl-related topics in keeping with this year’s theme, “Of Pearls and Gemstones – New Treasures & Challenges.” Four other notable presentations also will be made. See the AGA website for more information.